Given my new-found love of butternut squash, I've been looking for different ways to prepare it. As I was fixing the chicken the other night, I thought that butternut squash that had been roasted first and then mashed would be the perfect side. It was. And after the initial skepticism, even picky dd agreed. We all agreed that it does need lots of pepper, or it's a little too bland. 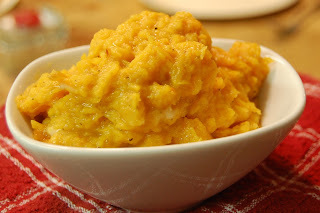 I sooo love butternut squash (as my post this afternoon will contine to attest to!) In my estimation its great in many dishes, but it is still in its best by simply mashing with some butter, salt & pepper!